In June, 1934 half of the US was over 100 degrees. So far this June, only a tiny percentage of stations have been over 100 degrees. The percentage of US stations reaching 100 degrees in June has plummeted over the past 80 years. Climate experts claim that increasing CO2 causes more hot weather, because they are paid to lie about the climate for government propaganda purposes. Now plastered all over MSM: Heat Wave India 400 deaths, 7 degrees above normal 47 degrees Celsius. Brainwashing the crowds. It’s a matter of weak trade wind, but already there are clouds. Less than one in three million people died. I wonder how many of them would have died anyway, because they were sick? Healthy people can not only survive intense heat, but run for hundreds of miles in it…without stopping! And they do so with zero protection of special equipment…just their own bodies and some water. If a person went to the coldest places on the planet without special gear, they would die before they could move a hundred feet. Even with special gear and clothing, a person on the coldest parts of the planet would not have long to live unless they quickly found shelter. The MSM flocks to wherever they can promote “Climate Change”..
More “it’s only resting” in run up to the Dead parrot talks ! Was the 1934 US Heat Wave an isolated event? In regard to the Climate Change Doctrine Humanity seems to follow the tracks of the Lemming. To many sheep, easy to manipulate and as usual, to much criminal energy among those in power. When will we breach this endless circle of rise and fall, restoration and destruction, war and peace? The Founders did 200 years ago and the Elite (bankers, aristocracy, mega-corporation owners) have been scrambling to get control back ever since. That was one of the reasons for the Civil War. England and France hoped to move in after the war and grab back the USA. Russia stepped in and promised to make it a war on two fronts so they backed down. That is why the Russian Tzar and his entire family were completely wiped out by the communists. It was part of the deal when the Banksters gave them the gold that FDR took from the American public. Very cold current in Central Europe and rainfall. “Below are ~40 peer-reviewed papers published in science journals that have low (2.0 C and less) climate sensitivity estimates (with values highlighted below). It’s too bad that the contiguous US is only 4% of the total area of the Earth. Therefore, only morans think they can guess global temperatures based on US temperatures. Steve Goddard is looking at the tempeature data of the USA. A group in New Zealand looked at the tempeature data of New Zealand and SUED. The drama hit the headlines worldwide in late November when serious questions were raised about the “adjustments” NIWA had made to weather records. The adjusted data shows a strong warming trend over the past century, whereas unadjusted records had nowhere near as much warming. NIWA promised to make its data and corrections fully available, but responding to an Official Information Act request their legal counsel has now admitted it cannot provide copies of the original adjustment records…. And then there is the Aussies. As we have said all along, the all new ACORN wonder-data was not created with the scientific method. Adjustments to Australian temperature data were done with a black box mystery technique that only the sacred guild at the BOM are allowed to know. Far from being published and peer reviewed, the methods are secret, and rely on — in their own words — a “supervised process” of “expert judgment” and “operator intervention”. In other words, a BOM employee makes their best guess, ruling in or out the “optimal” choices, making assumptions that are not documented anywhere…. There goes the “It was Peer- reviewed” excuse. While we are in the Southern Hemisphere we can not leave out South America. South America – Hockey in the Jungle? You might want to look at the post on either side of this dat since E. M. Smith goes trough the regions one by one. …One Small Problem with the anomally map. There has not been any thermometer data for Bolivia in GHCN since 1990. Canada – Top of the Hockey League (Part 1) again there are posts on either side looking at the data of the world section by section. Can’t leave out Frank Lanser and Nicolai Skjoldby who are collecting the original data in the original notebooks. They are concentrating on Europe but also got their hands on the data notebooks for Australia. The Original Temperatures Project essay maybe a bit more easy to follow. That is a round-up of a few of the independents. Then you have Russia who threw a hissy-fit right after Climategate because their temperature record was mangled and twisted into a hocky stick. On Tuesday, the Moscow-based Institute of Economic Analysis (IEA) issued a report claiming that the Hadley Center for Climate Change based at the headquarters of the British Meteorological Office in Exeter (Devon, England) had probably tampered with Russian-climate data…. ?The HadCRUT database includes specific stations providing incomplete data and highlighting the global-warming process, rather than stations facilitating uninterrupted observations. IEA analysts say climatologists use the data of stations located in large populated centers that are influenced by the urban-warming effect more frequently than the correct data of remote stations.…. The scale of global warming was exaggerated due to temperature distortions for Russia accounting for 12.5% of the world’s land mass. The IEA said it was necessary to recalculate all global-temperature data in order to assess the scale of such exaggeration…. A blockbuster Chinese study of Tibetan Tree rings by Lui et al 2011 shows, with detail, that the modern era is a dog-standard normal climate when compared to the last 2500 years. The temperature, the rate of change: it’s all been seen before. Nothing about the current period is “abnormal”, indeed the current warming period in Tibet can be produced through calculation of cycles. Lui et al do a fourier analysis on the underlying cycles and do a brave predictions as well. In Tibet, it was about the same temperature on at least 4 occasions — back in late Roman times — blame the chariots, then again in the dark ages — blame the collapse of industry; then in the middle ages — blame the vikings; in modern times — blame the rise of industry. Clearly, these climate cycles have nothing to with human civilization. Their team finds natural cycles of many different lengths are at work: 2-3 years, 100 years, 199 years, 800 years, and 1324 year. The cold periods are associated with sunspot cycles. What we are not used to seeing are brave scientists willing to publish exact predictions of future temperatures for 100 years that include rises and falls. Apparently, it will cool til 2068, then warm again, though not to the same warmth as 2006 levels…. Amplitudes, rates, periodicities, causes and future trends of temperature variations based on tree rings for the past 2485 years on the central-eastern Tibetan Plateau were analyzed. The results showed that extreme climatic events on the Plateau, such as the Medieval Warm Period Little Ice Age and 20th Century Warming appeared synchronously with those in other places worldwide. The largest amplitude and rate of temperature change occurred during the Eastern Jin Event (343–425 AD), and not in the late 20th century. There were significant cycles of 1324 a, 800 a, 199 a, 110 a and 2–3 a in the 2485-year temperature series. The 1324 a, 800 a, 199 a and 110 a cycles are associated with solar activity, which greatly affects the Earth surface temperature. The long-term trends (>1000 a) of temperature were controlled by the millennium-scale cycle, and amplitudes were dominated by multi-century cycles. Moreover, cold intervals corresponded to sunspot minimums. The prediction indicated that the temperature will decrease in the future until to 2068 AD and then increase again…..
Gail, I tried to share this post on my FB page, and was told it cannot be posted because of complaints about it. So it begins…FB is now censoring certain media and stories. A Chinese study of tree rings, no less. Looks like some people se this as very threatening. I will get it posted, and a lot of my friend will share it widely. Try posting the study only without Jo Nova’s commentary. Doesn’t matter. There is NOTHING offensive in anyway in the content. This is an example of just one of several good reasons why I’m not on FB. Darn, doesn’t the LIA (which we have fortunately recovered slightly from) stand out like dog’s b***s.. Also the MWP !! But… But… But… All those places only add up to 40% of the world’s land mass. What about Antarctica? Oh yeah, that’s cooling. But what about Africa? I’m sure that’ll show off the charts warming, if we ever get any data from there. And the oceans. Didn’t NOAA just prove that the oceans have warmed in the past 20 years, if you exclude the most accurate measurements, heavily adjust the rest, and ignore everything before 1995? There. That proves it. Of course, there’s an enormous hole in cfjg’s reasoning. The continental US data is universally seen as the most complete, and most accurate data set. Tony’s not just claiming that it used to show cooling, he’s claiming the current data is fraudulent. And he’s providing solid evidence. If we can’t trust the first tier data, or, as Gail pointed out, most of the second tier, then what are we basing all this on? The only other presumably good data is from western Europe, covering less land mass than the US. And I’m sure some arguments could be made for tampering there, too. The rest of the world has very spotty coverage, and lousy scientific practices. Most of the data from Africa, south/central America, and the middle east are corrupted by accident before anyone gets a chance to tamper with them. Cjfg, if you want us to accept that we should turn over huge amounts of freedom and money to the very governments collecting this data, you need to show that they’re doing it honestly. That means total transparency, open books, openly published algorithms, error margins, a complete record of all adjustments made, and specific justifications for each of them. THAT is peer review. Hansen checking Mann’s work, behind closed doors, is not. And your argument that Tony only proved the best 4% of the data is fraudulent, (in this post) does your side more harm than good. You’d do better to show us WHY those adjustments were made, and explain why the powers that be didn’t even feel it necessary to tell us they made them. That hole relates to lack of a brain. ! Only a moron (you) would think that this is a discussion of global temperatures. We in the US have been constantly berated as being the greatest “pollutor” and blamed disproportionately for causing the most global warming. If so, why has global warming somehow managed to skip over the US? And what kind of a “moran” thinks that the planet can heat up over a period of years and years, but an entire large continent can grow ever colder at the same time, and again over many years? And as Gail rightly points out, the same ridiculous thing seems to be happening everywhere else too. So, Einstein, how is it that nearly every place on Earth is getting cooler, but the whole planet is getting warmer? But the real question is, how can a human being survive and retain a shred of sanity while in a state of nearly complete cognitive dissonance? It’s too bad that the contiguous US is only 4% of the total area of the Earth. Make it a peer reviewed reference. cfgj: No serious scientist thinks that one can “guess global temperatures based on US temperatures”. That’s not how the climate science is done – one needs a comprehensive measurement of surface, air, and deep sea temperatures. Temperature is a measure of heat content, and heat is energy. With more CO2 in the atmosphere (a fact I don’t think is in dispute, even at this website) there is more energy being absorbed by the planet than reemittied into space. This is just physics. There is lots of good information – true “real science” – over at http://www.skepticalscience.com/graphics.php?g=7 Physics is physics, and the folks at this site just want to put hands over their ears and say “la la la la la la la!” for reasons that still elude me. Hey John! Please do me two favors. In am willing to discuss this with you further tomorrow, but if you need more time, I more than understand. But why is the temperature only 92F in DC when I look? Because the NWS has turned up the temperature to 105F by using a “Heat Index Value”. This just feeds the Global Warming mantra. It is deceptive. Now I’m waiting to see their new “Ice Volume Index” for the polar ice that is present but “feels melted”. Applying the new “Ice Volume Index” the to the Arctic today would make the pole totally ice free and the Northwest Passage Open for shipping. At least it would “feel” ice free… just believe. It also was very hot in the New York city area in 1965. I was not happy since I finally got a horse that year. Temperatures in the high nineties and even 100 F are not really that uncommon from DC south. It was 98 in New York City yesterday. Yes, I had a carriage and two horses back then…and an ox team…and yes, it was tremendously hotter than this last several years in Upstate NY. We were living in this tent complex back then and when Pinatubo volcano blew up, we were in deep, deep trouble when it suddenly got terribly cold and lots and lots of snow. We survived the ‘Storm of the Century!’ blizzard in that tent complex. We took the horses inside, I put boards over the windows (yes, tent had real windows!) and the glass in the windows literally bulged inwards when the gale hit over 90mph which is, in snow conditions, like hitting a brick wall. Then it warmed again until 1999. We moved into the house I built and it has been cooling down steadily. I burn more cords of firewood each year. I worked outside in the DC area in 1998. We had several heat waves with temps 98-102 for 7 straight days. Hottest year evah! no one can convince me we have had hotter years since. I worked out side in North Carolina in 1998 and we had the same very hot weather. Since then Jeff Masters has downrated that summer and not a single day over 100F is to be seen in his historic data. The “Ice Volume Index” is to measure all that trans-frozen water. It’s been almost 700 days now since Houston hit 100 degrees. Until 30 June the situation changes. There will be heat just to the west US. You should be aware actual temperature of the ocean. It is not too high in the equatorial zone. There is no hurricanes, because the surface temperature is too low. and there will be no el nino either. Yes there will. It’s coming later in the year and taking longer to develop than most but it’s coming. And the Warmists will make the most of it even if it is a wimp. When NOAA and Joe Bastardi agree then one maybe should listen? The ENSO is there. As an inmate of southern California, I hope you’re right. This drought is by no means unprecedented, but the population here is. If we don’t get more rain this winter than last, our reservoir will run dry sometime next summer. And we’re doing better than much of the state. This is a really classic chart. It shows the cold water running up both sides of South America and Africa from the Antarctic Circumpolar Current. You can also see “…the trade winds push the warm water to the west…” However it is a SURFACE sea temperature chart. The one point I missed and so have you is one that Bob Tisdale emphases. It is the size of the return current, the downwelling (warm) Kelvin wave. So it is the cross section of the subsurface temperature anomalies of the equatorial Pacific from the NOAA that tells you whether or not an El Niño is occurring and not the sea surface temperature charts. Now the rest of it from Bob Tisdale who has been studying ENSO for years. 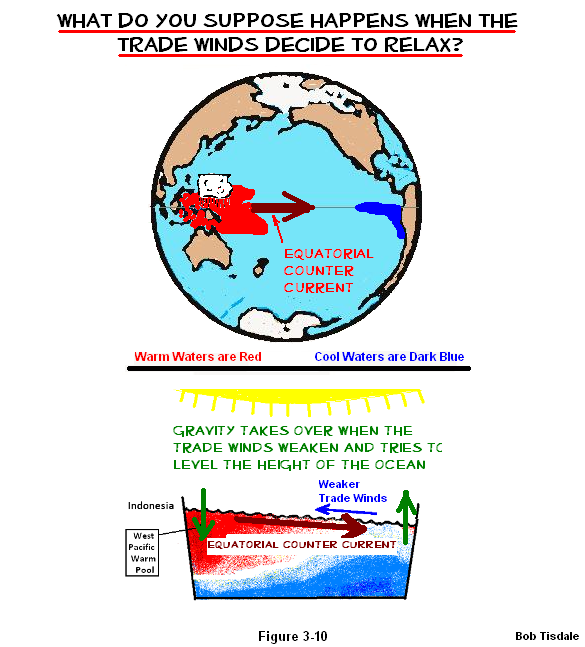 The trade winds in the western Pacific are, like all winds, quite variable. They strengthen and weaken with changes in weather. The size and shape of the Pacific Warm Pool varies in response. However, under “normal” conditions, the trade winds continue to hold the warm water in the western tropical Pacific…. That is what I am seeing in that map right now. Warmer water held in the western tropical Pacific and around India. So what does it take to make this a real El Niño event? So what is Bob saying about the present conditions? The 2014/15 El Niño Series Posts unfortunately they have not been updated since April 2015. In short, when the predominant pressure in Australia and the SW Pacific is higher than that to the east, the trades are going to turn! And when the trades do a 180 then the major limiter stopping the transport of heat to the east is gone. I believe June 1933 was even hotter than June 1934. In any event, July 1934 and July/August 1936 made any recent summer look like a walk in the park by comparison! As ren as already pointed out, the pattern is going to get much cooler in the eastern/central US starting over this weekend and lasting well into July. Looks like another record corn/soybean crop this year. The alarmists can stick that in their pipe and smoke it! Thousand protesting / rioting in Armenia over a 21% hike in electricity prices. Not sure exactly why electricity prices are going up, but it does go to show that if the leftist Chicken Littles managed to get electricity prices to truly skyrocket as they want … it would not go down well at all with masses. The left has miscalculated. So the fraudulent records caused record Artctic sea ice loss, Antarctic ice shelf loss, mass-loss from ice sheets (both poles) as well as retreat of mountain glaciers and ice caps globally, as well as global sea level rise and warming up of the water column? That’s a helluva conspiracy! cfgj, we’ve all been waiting for you to complete the trilogy of idiocy. We’ve already got the conspiracy theory, but we still need tinfoil hat and Dunning Kruger to complete the set. Can we have them? No more conspiracy theory though, got it. “record Arctic sea ice loss”, they happened in the early Holocene. “Antarctic ice shelf loss,” in one very localised area, almost certainly volcanic issues, nothing to do with global anything. “warming up of the water column”….is not happening, a figment of their and your desire. AGAIN, every one of your little causes is based on NOTHING. You are continuing to prove yourself to be a non-learning, ignorant, dishonest, propaganda brain-washed drone. You forgot — He is a good little serf working for the benefit of Shell oil and the Royals and Banksters who own the company. And no I am not kidding. Shell Oil has finger prints all over CAGW. First Shell Oil provided part of the original funding of the Climate Research Unit at East Anglia allong with the Rockefeller foundations. Ged Davis a VP of Shell is lead author of Scenarios for the IPCC, Shell Oil exec Doug McKay was also at the IPCC scenario meetings. McKay is a Senior Financial Analyst with the World Bank too. Robert Watson worked for the World Bank while Chair of the IPCC. Muller of BEST has Marlan Downey, “Former President of the international subsidiary of Shell Oil” as a consultant for his firm. David Hone is not only SHELL OIL’S Senior Climate Change Adviser he is also Chairman of the International Emissions Trading Association. John H. Loudon, Better known as “the Grand Old Man of Shell”, John H. Loudon, a Dutchman, headed Royal Dutch Shell from 1951 to 1965…. He was President of WWF from 1976 to 1981, and also a member of The 1001. Ruud Lubbers served three terms as Prime Minister of the Netherlands between 1982 and 1994, thus becoming the longest serving Dutch Prime Minister…. He continued in Parliament as Senior Deputy Leader, and later Parliamentary Leader of the Christian Democratic Alliance. He became President of WWF International on 1 January 2000, but only served for one year. Then we can look at the Shell Board of Directors. … He is Chairman of the Board of Directors of Zurich Insurance Group Limited and of Zurich Insurance Company Limited, positions he has held since March 2012. … he held a variety of positions in corporate banking, foreign exchange/money markets, treasury and investment banking. In 1990, he was appointed to SKA’s Executive Board, on which he served as President between 1993 and 1996. He joined Deutsche Bank’s Management Board in 1996 with responsibility for the investment banking division and, from 2006 and 2002 respectively until May 2012, he was Chairman of the Management Board and of the Group Executive Committee of Deutsche Bank AG. He is a member of the Supervisory Board of Siemens AG, the Board of Directors of Investor AB and a number of advisory boards. He also has various roles in several foundations and academic institutions…. … He served as Chief Executive Officer of DuPont from 1998 to January 2009, and as Chairman from 1999 to December 2009…. He previously served as Chairman of the World Business Council for Sustainable Development, Chairman of The Business Council, Chairman of Catalyst, Chairman of the Society of Chemical Industry – American Section, and is a founding member of the International Business Council. He is Chairman of the Board of Directors of Bank of America Corporation…. She is a founding partner of the law firm of Stuntz, Davis & Staffier, P.C., based in Washington, D.C. Her law practice includes energy and environmental regulation as well as matters relating to government support of technology development and transfer. From 1989 to 1993, she held senior policy positions at the U.S. Department of Energy, including Deputy Secretary. She played a principal role in the development and enactment of the Energy Policy Act of 1992. From 1981 to 1987, she was an Associate Minority Counsel and Minority Counsel to the Energy and Commerce Committee of the U.S. House of Representatives. She chaired the Electricity Advisory Committee to the U.S. Department of Energy from 2008 to 2009, and was a member of the Board of Directors of Schlumberger Limited from 1993 to 2010. She is a member of the Board of Directors of Raytheon Company. [Raytheon does mostly government contracts G.C.]….. I think you get the idea. No conspiracy necessary when you have the same cast of characters repeating over and over in banking industry and the government. 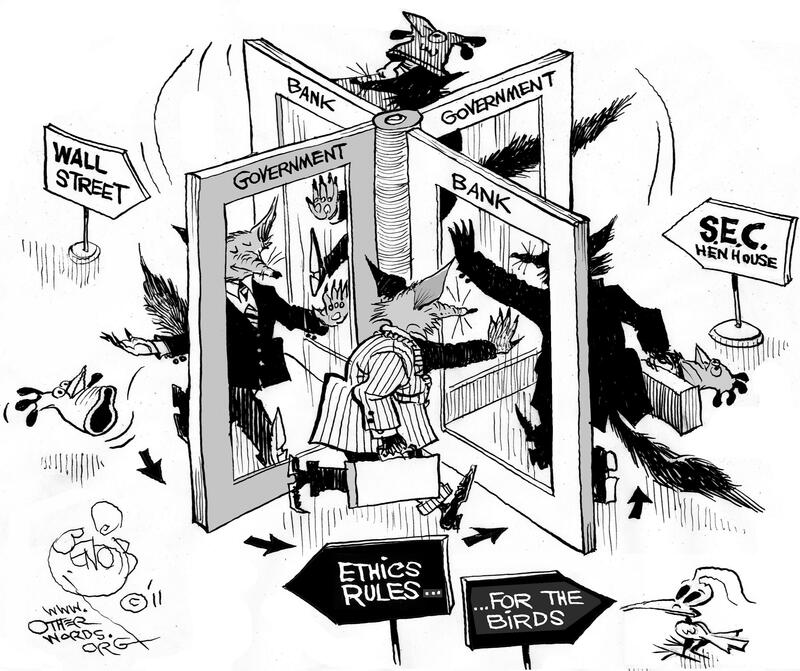 aka the Revolving Door. Regardless of which direction we head, Big Oil will always have their finger in the pie. You have keen insight, Gail. If you control food and fuel, you control life forms that depend on these. There are indications that deceptive government science is intended to hide abundant energy. Who is to blame? Communists, Capitalists, the Pope, Obama, Putin, Stalin, or Abe Lincoln – for making a private, self-perpetuating group of distinguished scholars in 1863 into the National Academy of Sciences to advise the government on all matters related to science and technology? There is plenty of blame, but we should focus our efforts on getting “the jackass out of the ditch“ before it expires! Do you know any trusted radiation physicist or radiation oncologist who might view and comment on Winsor’s report? So says the woman likely unemployed, on the dole and friendless. Certainly employable due to a DSM V paranoia and inferiority complex. How did you do in your partial differential equations class Gail, or have you never heard of them? 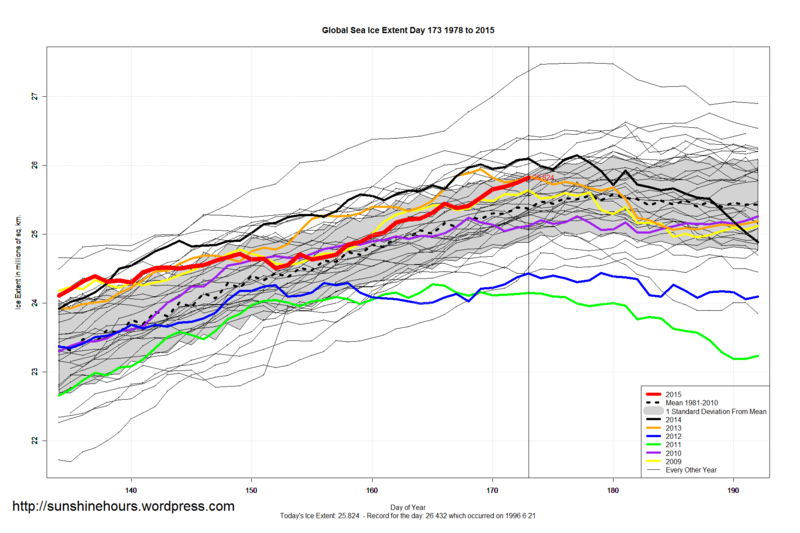 The last I looked, global sea ice is right around the long term averages. Nearly 1 deviation ABOVE the 1981-2000 mean! No it isn’t, look at the volume. You haven’t read any of the post about that, either, have you bonehead. ! I have decided cfgj is David Appell, because nobody else could be this stupid. I believe you have hit the bullseye..! Señor Apfel looks to be stalking Tony again. cfgj very much reminds me of David The Appalling, a paid disinformation agent. Heat wave in Pakistan kills 620…. Same temp in Las Vegas…. No reports of death…. Was it the heat that was the problem??? No, it was the lack of electricity and modern civilization that kills. It was Air Conditioners making a big difference. Insulation and a well sealed dwelling and good blinds or curtains make a huge difference also. Keep our A/C set at 70 deg. F during the summer because I’m hot blooded. Was without power Monday for 5 1/2 hours. A car hit a pole down the road at 12:30 PM. Temps in high 80s, high humidity, bright sun shine. I had been mowing so was warm but came into the house an hour after that happened it still cooled right off. Unable to take a shower because I’m on a well, and needing to get some sleep because I had already been informed I would be driving to Smithville, TN and departing at 11:30 PM. After cooling off I just changed into some sleepers and laid down in our bed room on top the bed spread. Our bed room is right on the NW corner of my home and thus directly exposed to the afternoon sun with two outside walls. Both the west and north windows have good plantation blinds on them so I can make it pretty dark in that room because I have to since my job requires I be able to get sleep any time of the day. Slept very well until the power came on at 6:00 PM when I got up and took a shower and put on fresh sleepers then slipped between the sheets to sleep until 9:30 PM when I got up and got ready to go. The thermostat, which is also located in a room on the west side of the house, indicated it had warmed only 5 degrees during those 5 1/2 hours even without AC during the hottest part of the day and with constant sunshine, during the those 5 1/2 hours without power. Good insulation, good new double pane windows on the N,W, and S sides of the house (have the windows but have not replaced the old ones on the east side yet), well sealed outside doors, and good insulation and effective blinds make a huge difference. Though I have not re-insulated the walls in this home and I have vinyl siding the insulation values of the walls seem pretty high. That siding was put over the original siding which was wrapped and so is still very effective though I’m sure the original cellulose insulation in this house built in 1944 has settled some. The attic has 10″ of fiberglass insulation. The roof has a 4 year old thick dimensional shingles over slats. They used slats back in days when this house was built instead of plywood or OSB sheeting. Personally I thought that it did very well. I cool most of my house using window fans at night and shutting the windows and drawing the blinds and insulated drapes when the temp goes up. It takes hours and hours for the house to finally start heating. It is hot nights that are a royal pain. 2X6 walls with spray foam insulation, patina green metal roof and white metal blinds. Keeping the infrared heat out is a big part of keeping cool. I also made sure my attic is more than adequately vented, which allows me to go up there even on the hottest days without discomfort. I rarely run the A/C during the day, as the house stays cool from the previous night’s open windows or A/C. Gator mine aren’t “6” but a real 4″ because my house was built when a 2×4 actually had those dimensions. I designed and built my house with the help of a contractor, and I used forms of insulation he had never even seen before. I will eventually be off the grid. One of these years we will finish off the attic and insulate the sloping walls and the area above the tresses. It has a regular staircase and regular windows so will the attic will make two very nice rooms. Don’t blame the religion (unless it is a cult, and not a religion, in which case the builder could be brainwashed), blame the man. Too often people conflate the acts of men with religion. Gator, that paticular religion does not honor contracts if the contract was made with someone out side their religion. I have yet to have ANYONE of that religion actually honor the contract they made with me or my husband or my business. We have zero problem with any other religion and we have dealt with many different religions. I figure a 100% failure rate points to the religion as the problem. I still believe that the main driver in the public support of the theory of AGW, is the advent of color printing on the weather page in our nation’s newspapers. Those yellows, dark yellows, orange, burnt orange, red, and then dark brown colors in summer are downright intimidating. Prior to this modern era, it was all shades of grey. President Eisenhower was not the first to warn of military-industrial complex and the Banksters and their buddies have been in control of the news media ever since. It is useful to understand the times here, otherwise one could be stuck on a century ago and assuming everything is still the same. William Jennings Bryan had quit as Secretary of State in protest of Wilson’s support of the World War I’s Allied side, with loans and supplies. Wilson had been successful in convincing Germany to stop submarine warfare against merchant ships (avoiding a repeat of the Lusitania) and had just been re-elected on the result: “He Kept Us Out of War!” was his campaign. But a week before the Congressional session you quoted, Germany had decided to resume submarine war against commercial vessels. Had the “Military Industrial Complex” really controlled things the previous year as suggested, Wilson would never have been (barely) re-elected, and pro-war Hughes would have been president. As it was, within weeks, the US would enter the war. The negative media about the military over ensuing decades (the Vietnam War being a gigantic example of this, and everything since) are also illustrative. These constant attacks demonstrate that if the military-supporting interests controlled the media, they’ve done the world’s worst job of damage control. Lots of money from lots of interests are involved, but all of these play against the media’s long-standing and ever increasing dedication to progressive ideals. It is far more complex than the “military-industrial complex” fixation does justice to. It is worth noting that Eisenhower was warning to keep them from gaining too much influence, not that they already had it. Indeed, this is a description of the Global Warming Catastrophists writ large. I was basing my comment on the Congressional Record and on the destruction of this book: Your Country At War and What Happens To You After A War by Charles A. Lindbergh Sr.
…On a spring day in 1918 several government agents entered a printshop at Washington, D. C., where the original edition of this book was being printed. “Destroy all the Lindbergh plates in your plant,” they told the head of the institution. He was forced to comply. The hysteria of war-time brooked no delays. Not only were the plates of this book “Why Is Your Country at War ?“ destroyed, but also the plates of Congressman Lindbergh’s book “Banking and Currency,” written in 1913 and attacking the big bankers and Federal Reserve Law. So was the pat painstaking effort of months wiped out. Only a few hundred copies of this book had been printed, and they were sent to Minnesota for use in Congressman Lindbergh’s campaign for the governorship of that state. In 1923 Dorrance & Company issued Congressman Lindbergh’s “The Economic Pinch,” long out of print, as are his other writings, so that the present volume is the only one of Lindbergh’s books available to the American reading public today. Lindbergh transferred the copyright to me late in 1923, when I was associated with him in the practice of law at Minneapolis. We intended to use the book in his 1924 campaign for governor, but death took him on May 24, 1924, and the project was halted. As the years have passed the book has become more and more amazing. In the light of things now happening it is a most uncanny prediction of economic trends, twenty years ahead of its time. The Pecora investigations of “big bankers” and “high finance” are revealing things in 1933 and 1934 that were foretold by Lindbergh, in 1917, with real accuracy. The book even predicts the use of a plan almost identical with the NRA and Lindbergh’s discussion of the results of such a plan is interesting. Every person, giving thought to economics, realizes that, we are entering into a “New Deal,” a realignment of the social and economic order. Just how far this adjustment will go nobody can foretell. Our country is as truly at war as when the armed millions of men were marching in Europe. The first day I met Congressman Lindbergh he was chased out of Minnesota by a sheriff….. So that Congressional Record in 1915 and the destruction of the books in 1918 not to mention the fact that Federal Reserve Act was signed by President Wilson when it was ‘passed’ by Congress after most members had gone home for Christmas, put Wilson in the pay of the BANKSTERS. I loath the man and hope he is residing in Dante’s ninth level with the rest of the traitors. Wilson was the most evil man to ever occupy the Oval Office, and the fact that he is one of the greatest progressive heroes serves to confirm this. Thomas Sowell wrote a great piece on Wilson, but the evil runs so deep and wide it would take a four year degree in Wilsonology to understand it all. I even hate the sight of the Wilson Bridge in DC. Thanks Gator, I will read that some time tommorrow. As far as I am concerned Wilson and FDR sold the american public into slavery. we are just too stupid to realize it. So it is not like these politicians didn’t know they were completely screwing over the American public. That reminds me. 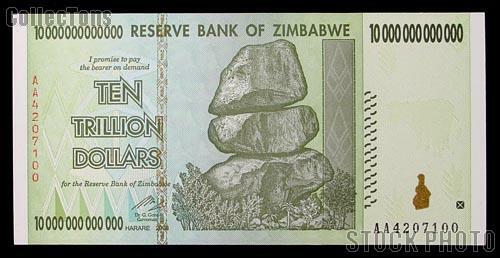 Did I mention I am now a trillionaire? So much for the Drax wood pellets farce !!! So someone finally figured out shipping wood chips from NC to England to burn was idiotic and produced more CO2 for less net energy. About time. That reminds me of some firewood bundles I saw at a grocery store, a few years ago. The brand was, I believe, “Eco-Forest,” and the label said it was a wood that I didn’t think grew in this area. (some kind of birch, I think) So I read a bit more of the label, expecting to see that someone had planted a commercial forest in the area. Instead, it said, “Product of Estonia.” That’s right, there were chopping down trees in Estonia, cutting them into 16″ split wedges, and shipping them to southern California, to be sold as firewood. And they had the b***s to name their company Eco-Forest? Considering 90% of that wood is burned in the campgrounds 2 blocks away, they could just as easily be selling Eucalyptus. (you don’t want to burn that in a fireplace, though) Those trees are basically weeds around here. A Dutch court ruled the government has duty of care and cannot hide behind claims that the Netherlands is a small part of a world-wide process. The judge said that the CO2 reduction would stay below 17 percent in the Netherlands, in spite of climate treaties. HE concluded that climate change is caused by emissions and that this entails serious risks, including sea level rise and for food. The government should protect citizens against this. And there are more stations today than in 1934!